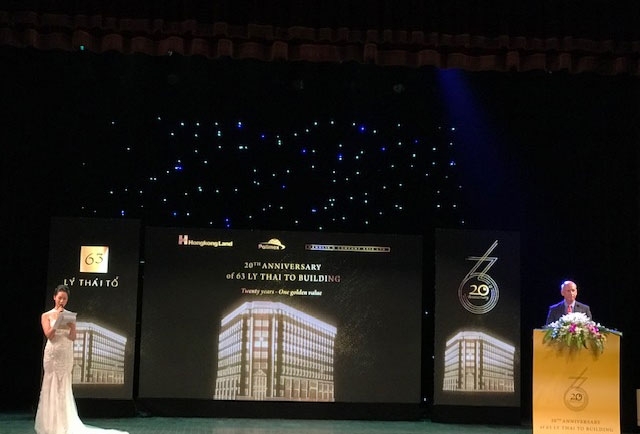 This evening, November 21st in 2018 in Hanoi-Vietnam, Hongkong Land has organized the celebration of 20 years of activity 63 LY Thai to buildings. This is a building with 8 floors of offices and shops, high-end class A located right in the Centre of Hanoi. The celebrations with the presence of the diplomats, the head of the leaders in the financial corporations, international organizations, with representatives of several ministries of the Central Government and the city of Hanoi. Completed in March 1998, 63 Ly Thai To is owned 74% by Hongkong Land, with Chan Hung Polimex Limited under the arm of The Vietnam Father Land Front, and Manolis & Company Asia Limited, as joint venture partners. The Grade A retail and office development offers 8,000 sq.m. of premium accommodation over eight floors and also has a basement car park. 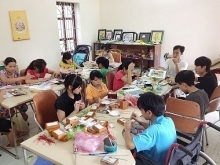 It is one of the first buildings in Vietnam to have column-free floors and under-floor cable trunking, with international standards of construction, facilities and management. Situated at a major intersection on Ly Thai To road, 63 Ly Thai To is in a prime location in the centre of Hanoi, close to the Hanoi Opera House, Government offices, and the international hotels. It has consistently achieved a more than 95% occupancy rate and in recent years the occupancy rate rental area has reached 100%. 20 years despite the economy as well as the market of real estate of Vietnam and the world has many ups and downs and difficulties, but with the position, a world-class construction, architecture, management and operation of the The 63 Ly Thai To building remains the choice of the customer, the international partners. 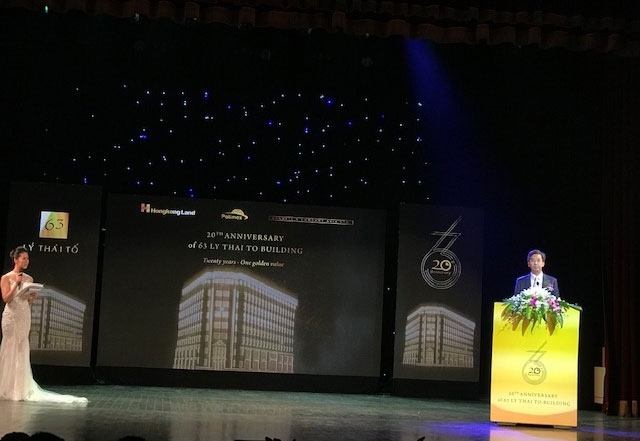 At the ceremony, Robert Wong- general director of Hongkong Land said, "In the early 1990s, Hongkong Land soon realized the potential of the real estate market of Vietnam and Hanoi. We are proud to have contributed to the development of commercial space with international standards the most advanced in the center of Hanoi. Success of 63 Ly Thai To Building during the past two decades is the result of deep collaboration, sustainability with partners and tenants ". 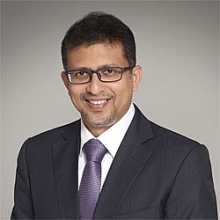 Fretting with obsessive memories of the early days preparing resumes, conduct building, Peter Ryder-Representative Manolis & Company Asia Ltd. said "this is the first project that we made in Vietnam. I remember starting from the first day when the fax machines of my office in New York to vibrate and the image on the map of Hanoi with a location to be circled (position Building 63 Ly Thai) and questions from the partners is "Do you care about this location." This is the start of great things for our future. With beautiful architecture, quality of construction and operation management of international standards, we are really proud of what we have created. After 20 years of mining, the building still showing class values have their own gold, and far outside the building of 63 Ly Thai To, we have many projects on high-end real estate in Vietnam". 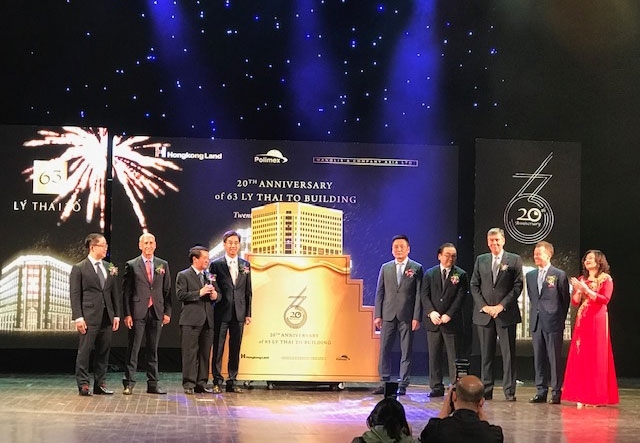 The 63 Ly Thai To building real estate project is the second high-end in the central area of Hongkong Land previously is the Center Building with 7 floors and 4,000m2 office area and a high-end shops are put into operation since 1995. In recent years, Hongkong Land is active in the development of housing segment in the city. 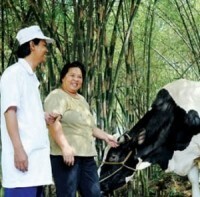 Ho Chi Minh has the first projects in District 1 and Thu Thiem new urban area. Last 6 months in 2018 was enterprise project handover Nassim at Thao Dien, District 2, Ho Chi Minh, the first luxury apartment project for customer. Hongkong Land believes that the real estate market of Vietnam will develop further and attract international tenants in the near future.